Edward Stanford rose to prominence during the height of the Victorian age a period defined by technological innovation, social upheaval, literary excellence and world exploration. Born into a family of tailors and drapers in 1827, Stanford attended the City of London School and afterwards in 1848 was employed by Trelawney Saunders, a seller of maps and charts in a stationer’s shop at 6 Charing Cross where just four years later, in 1852, he was made a partner in the business. 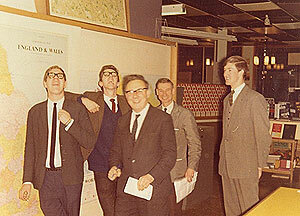 Later that same year however the partnership was dissolved. 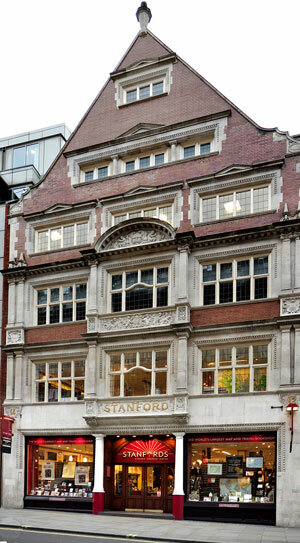 In 1853, seizing the initiative, Stanford became sole proprietor and expanded his shop to 7 and 8 Charing Cross whilst acquiring premises on Trinity Place for a printing works. This bold move solidified Stanfords as the largest, and indeed only map maker and seller in London at a time when British colonialism, the rise of the railways and the continuing popularity of the Grand Tour, meant demand for readily accessible, high quality cartography was building at remarkable pace. Stanford, together with Chief Cartographer John Bolton, set about work on a series of continental library maps, the first being his Library Map of Europe in 1858. Bolton would work for the company for 67 years, working on a wide variety of maps, including the 1862 Library Map of London which was recognised on its publication as “the most perfect map of London that has ever been issued.” by the Royal Geographical Society. 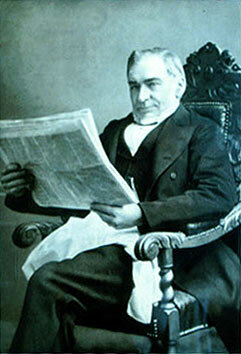 By 1873 the company had started to outgrow even its expanded premises and moved to 55 Charing Cross. At the same time, the print works moved to 12-14 Long Acre, the site of our flagship shop to this day. By 1877, some 24 years after its establishment, the company was in a position to acquire the prestigious Staunton & Son, the official “Stationers to the Queen” a mark of quite how far Edward Stanford, and his business, had come. In 1885, at the age of 58, Stanford retired passing over the company to his son, Edward Stanford II, who had had taken over day to day sales and marketing three years earlier. Edward Stanford I would die in 1904 at the age of 77. By this point, Stanfords had become the sole agents for Ordnance Survey Maps in England and Wales and in 1887 published Stanford’s London Atlas Of Universal Geography dedicated to Queen Victoria on the occasion of her Royal Jubilee. Still, it took a few years more for Edward Stanford II to receive his royal warrant as Cartographer to the Queen, in 1893. 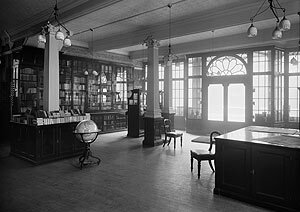 At the turn of the century, Stanford II made the decision to combine the company’s retail, print and cartographic works under one roof at the Long Acre site. Renovation was completed in 1901 when the doors opened to receive notable personalities of the day such as Florence Nightingale, Frederick Lugard, John Murray, Ernest Shackleton, Captain Scott and Francis Younghusband. As the Victorian Era gave way to the Edwardian, with the ascension on Edward VII to the throne in 1902, Stanford maintained his Royal role as the Cartographer to the King which seemed to confirm the business’s role in popular and cartographic culture even Sherlock Holmes was a customer, or rather Dr Watson, who is sent “down to Stanfords” in The Hound Of The Baskervilles to procure a map of Dartmoor. Indeed, with the outbreak of war in 1914 Stanfords became an integral publisher for the War Office. During World War I, in 1917, Edward Stanford II died and his son Edward Fraser Stanford assumed control of the business at the age of 32. The period between the wars saw the company continue to innovate and encourage exploration. In 1922 the company produced the world’s smallest ever maps for a series of atlases for Queen Mary’s famous doll’s house in Windsor; created the first Daily Mail Motor Road Map in 1926, which would remain in print for the next thirty years; and provided maps for adventurer Amy Johnson’s solo flight from England to Australia in 1930. As the prospect of a second war loomed in Europe in 1939, Prime Minister Neville Chamberlain commissioned a map from Stanfords to show the growing power of Hitler’s Germany. Evidently Fraser Stanford took this concern seriously enough to have the ceilings in Long Acre’s basement strengthened with iron girders. The premises would be used as a public air raid shelter, with two members of staff working every night to allow access at the sound of the sirens. Given its central location, and perhaps its tactical importance as a map maker, it was only a matter of time before the building took a hit. On the night of April 15th 1941, in one of the biggest raids on the capital, Stanfords was hit by an incendiary bomb which all but destroyed the top two floors of the building. However, the thousands of Ordnance Survey maps stocked by the shop in tightly constructed stacks actually helped halt the path of the flames and saved the rest of the shop from destruction. In a business move which his entrepreneur grandfather would perhaps have been proud of, Fraser Stanford continued to sell these maps in years to come complete with charred edges. The business passed to John Keith Stanford in 1944, after his brother Edward Fraser Stanford’s death, and in 1947 the new owner decided to sell the company to George Philip & Son, the cartographic publisher that had been founded in 1834. As Covent Garden began to be redeveloped into the popular London shopping district it is today, Stanfords focussed on its role as a specialist map retailer with a reputation for selling maps unattainable anywhere else in the country. Long Acre was enlarged and modernised and Stanfords buyers were able to gauge and even predict travel trends by the countless tourists and travellers who passed through the doors every day. In recent years, Stanfords has remained at the heart of popular and political culture. In 1982 during the Falklands conflict the British Army were forced to rely significantly on maps captured from the Argentinians relevant cartography was in short supply, with many believing that Argentinian diplomats had spent the months before the war buying up all Stanfords’ stock. In 1988 former Python Michael Palin launched his travel writing career as he departed Stanfords to travel Around The World In 80 Days. 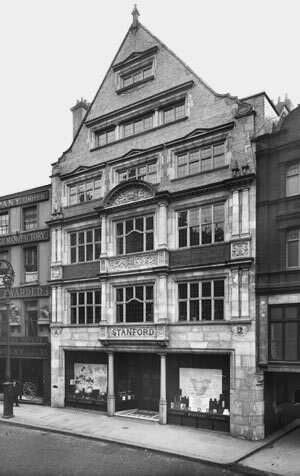 In 1997 Stanfords opened its first location outside London on Bristol’s Corn Street in the heart of the city’s historic market district, where it still is today, which also featured a Business Mapping service. 2001 saw significant change as the company split from the George Philip Group, but members of the Stanford, Philip and Godfrey families remain actively involved in the running and ownership of Stanfords to this day as Board members. As Stanfords celebrated its 150th birthday in 2003, a huge bespoke National Geographic Map of the World vinyl was created for the Ground Floor of the Long Acre store. Together with the Lower Ground Floor’s map of London and the First Floor’s map of the Himalaya, visitors from all over the world are as likely to be seen looking down at their feet trying to find locations they have visited as they are at books and maps. In 2007 Stanfords was at the forefront of the digital revolution as Stanfords Business Mapping Service transferred from Bristol to Manchester, later becoming Stanfords For Business. This cutting edge on demand online mapping and data system saw Stanfords awarded the Ordnance Survey Premier Partner status (the highest level possible) in 2007. In February, the company held the first Stanfords Travel Writers Festival at the Destinations Travel Show at Olympia, London. Around 14,000 people attended talks from adventurers such as Kenton Cool and Levison Wood, as well as over thirty other poets, travel writers and personalities including Simon Armitage, Kate Adie and Griff Rhys Jones. The Festival has continued to grow in 2016 and 2017 - listen to the events on the Stanfords Travel Podcast. Also in 2015, the company announced the inaugural Edward Stanford Travel Writing Awards, comprising the Stanford Dolman Travel Book of the Year, run in association with The Authors’ Club, and the Edward Stanford Award for Outstanding Contribution to Travel Writing. The 2015 winners were Horatio Clare for Down to the Sea in Ships and Bill Bryson, as voted by a panel of bookselling partners. Throughout 2015, Stanfords worked with the Royal Geographical Society to begin the process of digitising the company’s archive of historical maps. Some of these are now available for the first time in 100 years as part of the Edward Stanford Cartographic Collection. The company also announced its move into the licensing arena in the autumn of 2015, making its digital archive available for the first time to third parties. January of 2016 brought with it the opening of Stanfords Coffee House, a place for adventurers to sit and plan their next trip, or just enjoy a slice of cake. In February 2017 the second Edward Stanford Travel Writing Awards took place with Michael Palin taking home the Edward Stanford Award for Outstanding Contribution to Travel Writing. As well as the Stanford Dolman Travel Book of the Year, many more categories were introduced to the Edward Stanford Travel Writing Awards. In January 2019 Stanfords travelled around the corner from Long Acre to a new home at 7 Mercer Walk. Today, Stanfords remains a much loved and vital part of the travel landscape. As the world’s largest map retailer, Stanfords prides itself on the depth of its stock, sourced by experts, from all over the world. If you can’t find what you are looking for in store or online and, if it exists, Stanfords will make every effort to find it for you.